When I teach Constitutional Law as a political science course to undergraduates, most students arrive dedicated to the popular American constitutional trope known as ‘checks and balances.’ They are not alone. Immediately after the 2016 election, defenders of the Electoral College repeated the standard laudatory claims about its value everywhere from the American Prospect to the Washington Post, L.A. Times, and Boston Globe. In these arguments, the Electoral College is one of the many features of our Constitution that effectively neutralizes power by balancing the rights of the minority against those of the majority. Too much majority power, after all, is the path to tyranny. But this conventional view is simply wrong. Checks and balances are not the neutralization of power, but the exercise of it. And our failure to understand this basic fact about our political system is a large part of what ails American politics today. What Americans affectionately call “checks and balances,” political scientists call “veto points”—features of the political process where a political minority can stymie and even block the majority. The Electoral College is the most obvious of these points but there are many others, including equal representation in the Senate, judicial review, bicameralism, separation of powers, and federalism. The laudatory image of checks and balances as a system that helpfully constrains all groups in equal fashion lacks any account of actual power. ‘Checks and balances’ flattens the interests of all social, economic, or political minorities, as though they are all created equal, with the same need to ‘check’ the majority. But political power is not evenly distributed in society. On the contrary, as a general matter, power tends to concentrate in the hands of the few—the wealthy, the politically connected, and the cultural and socially influential. This simple fact is largely buried beneath the language of American constitutionalism, however. Every loser in the political arena is treated as potentially at risk from the winners. At risk of what, exactly, is never very clear, but James Madison and the dangers of ‘mob rule’ loom large in our national consciousness, at least among elites. Do national political majorities threaten the well being of every political minority? Do they routinely pose an existential threat to the lives and livelihood of the minority? Appeals to the value of ‘checks and balances’ assume that when majorities are blocked it serves to ensure that those in the endangered minority have their say. Contrary to the popular trope, our system of checks and balances does not avoid tyranny, promote liberty, or balance various interests. But that is not at all what happens. When veto points are activated, political minorities don’t just have a say, they get their way. The losers override the winners. Which political interests, which political minorities, have access to these veto points? As it turns out, political majorities—sometimes very large majorities—are often blocked from enacting policies that threaten the economic or social interests of powerful political minorities. These seemingly endangered, at-risk minorities consist largely of titans of industry, wealthy citizens, and powerful social and cultural leaders. In other words, contrary to the popular trope, our system of checks and balances does not avoid tyranny, promote liberty, or balance various interests. It reinforces existing power hierarchies by providing opportunities for the powerful few to thwart the preferences of the less powerful many. Some will argue that this is consistent with the intent of the Framers of the Constitution, who worried about the unpropertied masses. They sought to ensure the stability of the political and economic systems by limiting the power of mass publics. That may be true. But I am not interested in discerning what the Framers intended or debating how the Constitution should be understood today. Rather, I simply want to shed light on who actually wins and loses in this system today. And the reality is that checks and balances provide more opportunities for the well heeled and politically connected to protect their interests than it does for ordinary people to look after theirs. Examples abound. The Electoral College is the most odious of veto points in the American political system, and in 2016, a stark example of how the power of wealth defeated the political majority. But in our nearly 230-year history, different popular and Electoral College outcomes have occurred only five times. There are more common, but less recognized, veto points that routinely keep political majorities from governing, like equal representation in the Senate, judicial review and separation of powers/bicameralism. These institutions all fall within the category of ‘checks and balances’ and are lauded in knee-jerk fashion with little attention to their consequences. From health care to lead in the water, and fair immigration policy to gun violence, the American system of checks and balances far too often delivers benefits to the few at the expense of the many. Featured image credit: East front of the US Capitol by USCapitol. Public domain via Flickr. 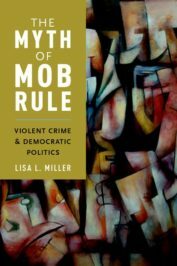 Lisa L. Miller is Professor of Political Science, Rutgers University, and author of The Myth of Mob Rule and The Perils of Federalism.